This entry was posted in Campus Announcement, Faculty, Students on April 17, 2014 by Wire Eagle. AUBURN UNIVERSITY – Two students and one faculty member were recognized with Auburn University’s highest honor for humanitarian service Tuesday, April 15, at the annual President’s Luncheon in the Student Center ballroom. 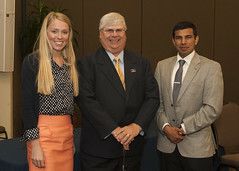 The Algernon Sydney Sullivan Award was presented to seniors Azeem Ahmed and Courtney Bessemer, and William I. Sauser Jr., a faculty member in the Raymond J. Harbert College of Business. Sauser, a professor of management, has provided more than 37 years of leadership, support and advocacy to the Raymond J. Harbert College of Business. He is the immediate past chair of the university senate, led the United Way campus campaign for five years and is vice president of the Greater Peace Community Development Corporation, a public nonprofit that helps provide a number of community and economic development programs in Opelika and East Alabama. Last fall, he received Auburn University’s External Consulting Award at the annual Faculty Awards ceremony. He will retire from the university at the end of June. Bessemer, a presidential scholar majoring in secondary science education, has devoted hundreds of hours to service activities within the university, local community and her home state of Florida. She has held several leadership roles in her social sorority and Alternative Student Breaks, a program that gives Auburn students the opportunity to perform community service during their academic breaks. Bessemer is a member of the Committee of 19 and Order of Omega and has volunteered with local municipal projects such as Katrina’s Kids, Camp Summit, Project Open Hand and Boys and Girls Clubs. In addition to the Algernon Sydney Sullivan Award, Ahmed also received the President’s Award and W. James Samford Jr. Foundation Award for the Raymond J. Harbert College of Business. He is an Honors College student majoring in finance and pre-medicine with a minor in sustainability. Through his involvement and guidance with World Food Programme, Committee of 19, Campus Kitchens Project, American Red Cross, March of Dimes and other programs in the fight against hunger, he was recently named the winner of the President William Jefferson Clinton Hunger Leadership Award, presented to just one university student worldwide each year. In 2013, Ahmed was the only recipient from the state of Alabama to be named a Harry S. Truman Scholar, one of the nation’s top academic awards for college juniors. Other honors presented during the luncheon were the President’s Awards and the W. James Samford Jr. Foundation Awards as well as the W. James Samford Jr. Memorial Scholarship. The President’s Award and W. James Samford Jr. Foundation Award recognize one graduate in each school or college who has completed at least three semesters at Auburn with a minimum grade point average of 3.40, and possesses outstanding qualities of leadership, citizenship, character and promise of professional ability. This year’s 13 honorees are: Sara Eugenia Geonczy, College of Agriculture; P. Bruce Pike Jr., College of Architecture, Design and Construction; Azeem Ahmed, Raymond J. Harbert College of Business; Allison Grace Thomas, College of Education; Mieke Chantal Groothuizen, Samuel Ginn College of Engineering; William H. Leonard, School of Forestry and Wildlife Sciences; Jakob F. Jensen, Graduate School; Sarah Beth Findley, College of Human Sciences; Chelsea Joy Leander, Interdisciplinary Studies Program; Patrick H. Donnan, College of Liberal Arts and College of Sciences and Mathematics; Adrienne Dawn Newton, School of Nursing; Morgan Burch Roehm, Harrison School of Pharmacy; and Susan McKnight, College of Veterinary Medicine. Richmond Baker Austin Gunter II was named the 2014 recipient of the W. James Samford Jr. Memorial Scholarship. The award is named in memory of James Samford, a 1972 Auburn alumnus and member of the Auburn Board of Trustees from 1987 until his death in 2003.